Milestone Moments offer a simple two-page design especially for the home. They provide a model for connecting significant occasions in people’s lives with the ongoing journey of faith. A Milestone Moment brings family and friends together to mark a special time in their lives and to acknowledge and affirm God’s presence in their midst. The moment could be getting that first cell phone, going back to school, going on vacation, breaking a bone, and a host of other life experiences. The options are endless and will be developed over time for quick and easy use among family and friends. Milestone Moments for the Home include an easy-to-use design that promotes Christian faith formation with family and friends. 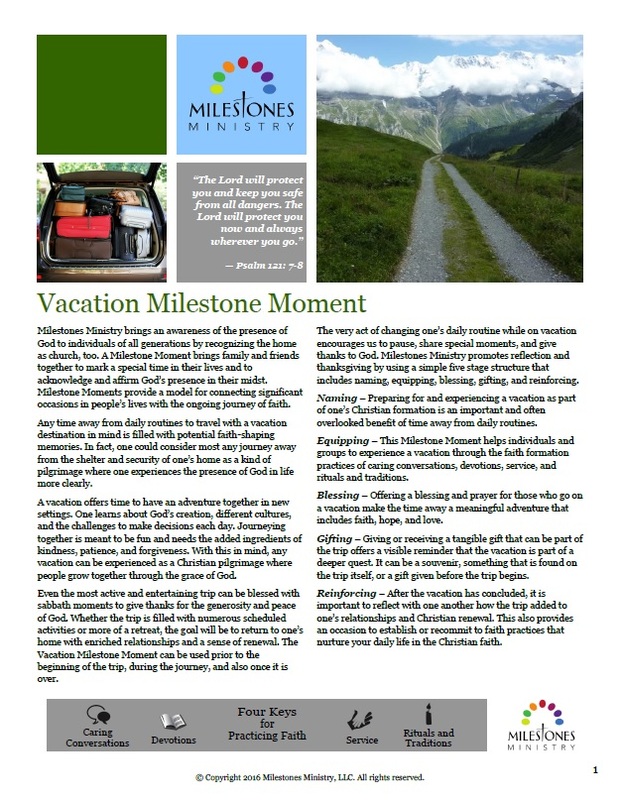 Milestone Moments are experiential and engage participants in the Four Key faith practices of caring conversations, devotions, service, and rituals and traditions. To make the moment more memorable and, therefore, capable of nurturing the life of faith, each Milestone Moment includes the Four Keys, a blessing and suggested gift ideas. It also provides the recommendation for a follow up experience to reinforce the importance and impact of this moment for the life of faith. Together, these elements offer a complete faith formation experience that will bless people’s journey of faith for a lifetime. In addition to the current Milestone Moments listed below, we continue to add Milestone Moments for the Home as we receive feedback from people like you. Milestone Moments are available as downloads.